The Department of Nephrology has a well-established out patient clinic with dedicated Haemodialysis facility in the OPD area itself. Twelve dialysis machines are in use and more are under procurement. 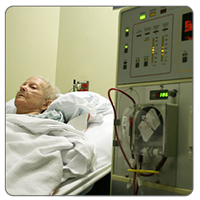 We have separate area of dialysis for HBsAg and HCV Positive patients and bedside dialysis for critical patients. The department is supported by diagnostic services and other facilities like critical care, ambulatory and non-ambulatory peritoneal dialysis etc. In co-ordination with the Department of Urology, this department is now poised to start its Kidney Transplant Programme within short period of time, with sophisticated facilities for tissue matching and an elaborate schedule for post operative follow-up care. The department is headed by Dr. M. S. Khanpet and we have other colleagues Nephrologists Dr. Ritesh Vernekar and Paediatric Nephrologist Dr. Mahantesh Patil. Having this team it is likely to achieve higher standards of care. For the long time the people of North Karnataka region had been deprived of quality Nephrology care in an attempt to over come the immediate and life threatening complication of renal failure. Dialysis Unit was started in KLES Hospital in 1987 and was shifted to the present location in the new KLES Hospital in September 1996. Our hospital is fully equipped to carry out renal transplant surgery and the first renal transplant surgery was carried out in December 1997.